JMU’s E.A.R.T.H. 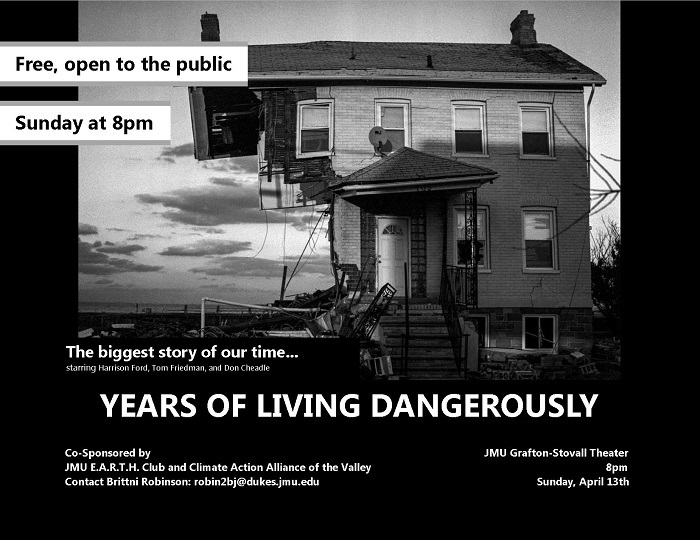 Club and the Climate Action Alliance of the Valley have joined together to host an early public showing, at the Grafton-Stovall Theatre, of the first episode of Years of Living Dangerously, 8:00pm Sunday, April 13th. Parking is available at the Grace Street deck. There’s plenty of room—everyone is invited–and it’s free! Click on image for Google map of JMU campus. The first episode stars Harrison Ford, Don Cheadle, and Tom Friedman.